There is something to be said for making your own cream soups for cooking. Anyone can open a can of condensed cream of ‘something’ soup. The canned version is quick and easy, but no one, and I mean no one needs that much sodium, MSG, or HFCS- I’m sorry, but what the heck is high fructose corn syrup doing in soup? I mean c’mon! I’ve probably made close to 2 dozen different kinds of soups in my lifetime and not one ever called for sugar, corn syrup or high fructose corn syrup. Not one. Ever. So what the heck is it doing in canned soups? The other ingredients found in these “Mmm Mmm” soups are just frightening. I looked up every ingredient that didn’t come from a plant in the ground, or didn’t roam the earth at one time, and after throwing up a little in my mouth, I told myself I was SO glad that I do not consume these soups any more. Some of the side effects of the ingredients that are used in those soups include but are not limited to: headaches, dizziness, nausea, vomiting, abdominal cramping, diarrhea, bad aftertaste, ringing of the ears, over-excitement of brain cells to the point that they ‘party’ themselves to death, heart palpitations and muscle weakness; just to name a few. Many of their “Mmmm” soups also contain caramel color(ing). Did you know that there is no caramel (candy) in Caramel Color? Did you know that caramel color is a chemical derivative of ammonia? Well, you do now. Did you also know that it is the end result of heating sugars with ammonia and sulfites under very high temperatures? And that end result; aka caramel coloring, is a compound that government studies have found to cause liver, lung and thyroid cancer in laboratory mice (Source). Makes you want to crack open a can of soup, or soda, or some other processed food with CARAMEL COLOR(ING) listed on the nutrition label, doesn’t it? Gosh, I sure hope not. 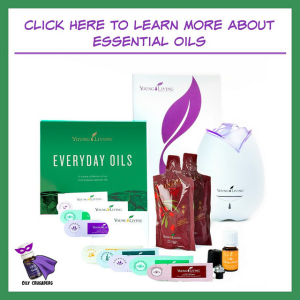 I know the list of ingredients that we should avoid is a long one and at times it seems to be growing just a little too quickly as more and more independent reports come in with information linking these synthetic ingredients to a plethora of diseases and conditions, disorders and scary symptoms. But this information is good. It’s very good that it is getting out there, and that we have access to it and we can decide whether or not an ingredient is something we want to continue to consume and/or have our children/families consume. Knowledge really is power, and with each new thing that I learn about what is in our food supply and what those hard to pronounce ingredients are that seem to be in just about every packaged food, I feel empowered and powerful. I have made amazing changes in not only how I think about food, and my body and myself, but how I eat, cook, shop and live and it’s all because of the power of knowledge. Someone get me a cape! Wait, wait- NO CAPES!! Edna Mode would be so proud! One night when I had zero motivation to make dinner, I figured something quick and easy was the way to go. Baked chicken and rice sounded good, but there was only one problem. 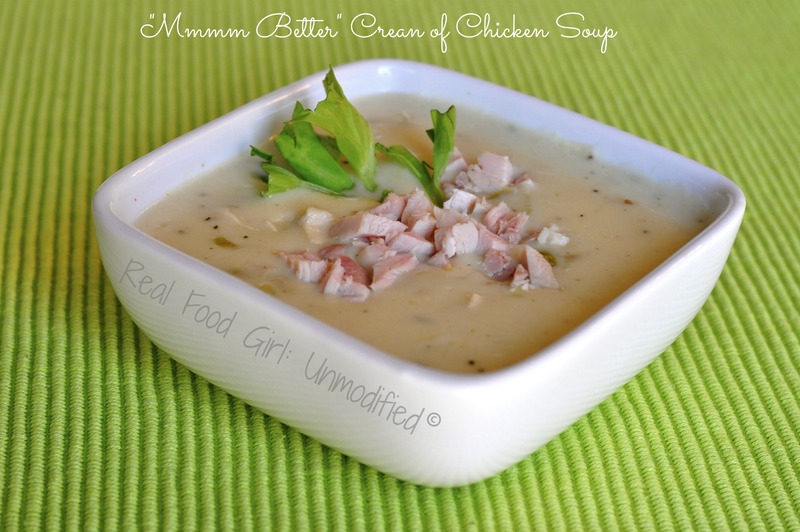 I don’t use canned cream of ‘crap’ condensed soups AND I didn’t have a substitute on hand. It dawned on me that it would probably take 20 minutes to whip up my own cream of chicken soup, and so that is what I did. The kitchen looked like a bomb went off by the time I was done, but it was so easy to make and so tasty, I almost threw that in a bowl and ate it for dinner. The only reason I didn’t is because The Stud Muffin (TSM) is very, very a wee bit picky when it comes to soup. I could eat soup daily. TSM on the other hand would rather have a root canal. Just like my cream of mushroom soup, this one freezes well. It is NOT condensed so it will be looser than the glop from the can. You don’t need it to be condensed. 1 cup of my soup has more flavor in it than 10-1/2 ounces of their condensed/concentrated ‘soup’. I made this version gluten free. After lamenting about my dislike of the texture of rice flour, and the fact that the thickening power of non-GMO corn starch stinks, my Culinary Guru friend mentioned I should try arrowroot next time. So next time I will. I still have to make a cream of celery soup, so we’ll use it for that. I felt that this soup would taste better without the flour, so that is why I chose to go GF. I did opt to use cream vs. milk to aid in thickening the soup a bit and for flavor and mouth feel. The end result was just plain good. You could taste all the layers of flavor, it made my taste buds sing, and I am pretty sure I violated my tasting spoon with my tongue. It was that tasty y’all. Let me just say that spending an extra 20 minutes to make my own soup for our dinner was so worth it. Just totally worth it. 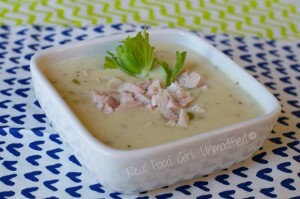 This soup can be baked into a dish where you would normally use canned condensed cream soups. I used it in my my chicken and rice bake recipe. The photos are pre my nice camera days, so I apologize for that. Add butter and olive oil to medium sized sauce pan placed over medium-high heat. Add the onion and celery a little salt and pepper and sauté veggies until translucent and softened about 5-7 minutes. You do NOT want to get much color on them- basically you’re sweating them. Add the minced garlic and cook for 1 minute- stirring constantly. Add the chicken stock and cook for 5 minutes, stirring frequently. Taste and add some salt and pepper. I don’t season my homemade stock, so this is where I add my seasoning. Slowly pour in a thin stream the corn starch and rice flour slurry and whisk vigorously to combine and ensure that no lumps form and nothing settles and sticks to the bottom of your pan. Add the cooked chicken. Stir to combine. Bring the mixture to a boil, reduce heat to low, whisk and cook until thickened slightly about 2-3 more minutes. Remove from heat, cool and store in heatproof, airtight containers. Will keep in the fridge for 1 week, and in the freezer for 2-3 months. Soup will thicken as it cools, but this soup is much looser than the Cream of Mushroom soup I made. Are those not the snazziest celery leaves, and most succulent chunks of chicken that you’ve ever seen? I’m like the Queen of fabulous garnishments. How happy am I to find this recipe? You’ll never know. I am allergic to soy so am having to make everything I eat from scratch because everything you buy has soy in it. Can you believe even in most flavors of Crystal Light? Crazy mess out food supply is in. 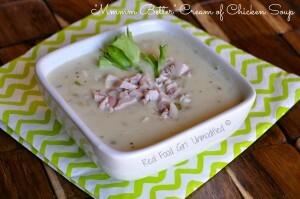 Anyway missing cream soups for my recipes. Can this be used for cooking as in baked Chicken breasts, Chicken Noodle casserole. etc. Has anyone tried it? Am wondering if they will break down during baking? Love your website! My question is: can you can this soup in mason jars? If yes, how long will it last? I know that there are certain ingredients that you can’t use when canning and that there also has to be a certain amount of acid (lemon juice, vinegar, etc) in order to can without creating a suitable environment for bacteria to grow. That being said, I have no idea if this recipe qualifies as safe enough to can for storage. I wish I could help you. Do you have any friends or family members that can that might know by looking at my recipe if it would be suitable for canning? Great substitute to use in casseroles if you’re GF. Thanks for this recipe and the cream of mushroom recipe, also. I suppose it would be helpful if I’d put that step in the directions, wouldn’t it? 🙂 You add it in step 8. I went ahead and updated this. Thanks for bringing it to my attention. What would you recommend for a dairy free option? Let me think on that. It won’t be a “cream” soup if you remove the dairy. Are you lactose intolerant? Nevermind, found it under the Share button. Thanks! I want to print this recipe but I dont see a button anywhere and it won’t let me highlight the words. Any suggestions? Thanks for posting. Looks marvelous. Can’t wait to try it. Thank you! I love remaking the bad stuff into good, wholesome stuff! I’ve been waiting for this recipe! Thanks for sharing! Blessings from Bama! YAY! You are so welcome, and thank you! What do you freeze the soup in? You can freeze it in any freezer safe, air tight container. I usually use tupperware or mason jars.